Baz Rhodes has been flying for 21 years and logs around 250 hours each year. In 1998 he won the Pennine Cross Country League and came fourth in the 1999 British Paragliding Cup which qualified him to enter the British Nationals. He came tenth in the first task in Mid-Wales and sixteenth overall. Also in 1999 he came first in the Scottish Open before leaving the UK to sample the fast developing flying scene in Algodonales. To add to their extensive paragliding experience in the French Alps, Baz and Sam visited Brazil and Piedrahita in early 2000. 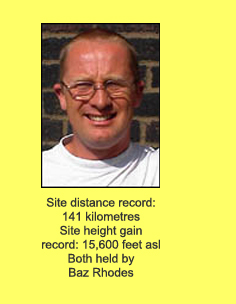 Together with his UK cross country flights, Baz flew over one thousand kilometres in the year 2000 alone and was fifteenth in the British Cross Country League. On a local level he was nominated Best Pilot in competitions representing the Pennine Soaring Club in 1999. In 2002 both Baz and Sam spent time in South Africa experiencing the unique cross country conditions before returning to Algodonales where they have run the highly successful Andalucian Experience for several years. Since 2002, Baz and Sam have spent most summers around Piedrahita, Pedro Bernado and Arcones, running numerous paragliding trips. Baz was a Trainee Instructor for Active Edge for three years but has not pursued a career in instructing due to commitment to his competition flying. However, with the vast knowledge accumulated during his career, thermalling and cross country guidance is all part of a stay at the Andalucian Experience. 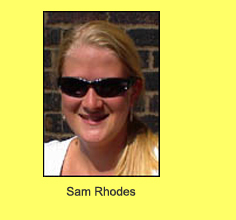 Sam is a flier too whose priority is to see that all the clients are well looked after. On the rare occasions when she has time free she enjoys topping up her paragliding hours and with her local knowledge of the house thermals may well be the one to watch! Thanks for a great week last week. Unfortunately after flying every day in Algo the grim reality of real life is not a nice experience. Nor is the British weather! The help and advice from you both was much appreciated. Many thanks for a wonderful weeks flying. I thoroughly enjoyed myself and feel that I made some progress with my flying skills. Without you all it would just never happen. Your knowledge of the local conditions is amazing, and your enthusiasm and patience with us will always be appreciated. Thank you again and I look forward to flying with you again in the near future. Just a note to say thanks for a great week. Just a quick word to say thanks alot for herding us lot around last week. Emma and I had a fantastic holiday. I know I am still grinning from ear to ear. Anyway bye for now, all we have to do now is to work out how to get back asap. Hope you and Sam (and Ben) are well. Thanks again for the fab time Mike and I spent in Algo in June. Big thanks to you, Sam and Johan for another great week in flying paradise. All the lads enjoyed themselves, and I know it far exceeded first timer Andy's (blue Bolero) expectations. I just wanted to write and thank you both for organising such a fantastic time for us all last week. I really enjoyed myself and will definitely return to you at some point in the not too distant future. As a customer would I suggest anything different? - no, everything you did was fantastic. Please do keep in touch with me if you do marketing e-mails etc, it will be a pleasure to hear from you. Thanks both once again and see you soon. Just thought I would send you a quick message following my stay last month. I am still struggling to find the time to edit all those super flights I had!! (I was well impressed). On viewing the footage, my special thanks has to go to Baz for all his advise and patience with me.... I didn't realise how much guidance & effort he spent on me (nerves I guess) - on all the videos he can be heard in the background, offering his words of wisdom - and not a dodgy word amongst them!!. thanks, again I would certainly like to return - if I can earn the 'brownie points'? Just wanted to say thanks for a great holiday! It was amazing to fly every day, and thanks to Baw for putting us on the right hills at the right times. I really feel like I progressed a lot, and I hope to come back one day. Say thanks to Dan again, I have been watching that DVD and it's great. ... What I might try and do is come out with them in late September next year, and maybe come on your Piedrahita trip on my own - so let me know when that is!